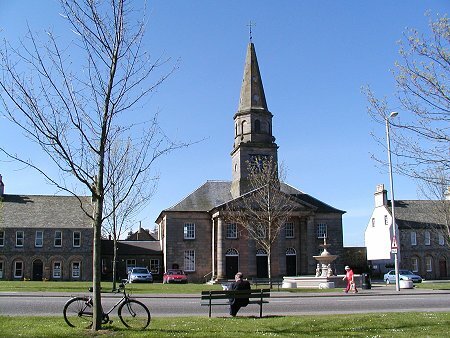 Fochabers can be found on the east side of the River Spey, near the A96 bridge across it. This is the nearest point to the sea at which the Spey is bridged, if you ignore a bridge built to carry a now disused railway. 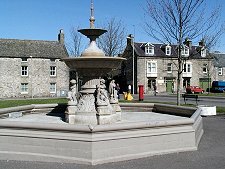 Fochabers, with a population of some 1600, is not a large settlement, but it is very attractive and offers visitors a selection very fine buildings to enjoy. It is also a key stopping off point on the route of the Speyside Way long distance path from Buckie to Aviemore. 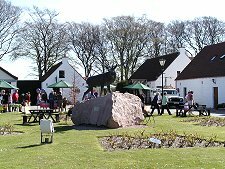 Its focus is a large grassy square in the centre of the village. Fochabers has become a much quieter and more attractive place since the opening at the beginning of 2012 of a bypass. This passes to the north and east of the village, and takes away the through traffic that once thundered through. As a result it is much easier to appreciate the splendour of the place. The fine Georgian church on the south side of the square is especially striking, complete with its clock-tower dated 1798. In front of this you find an impressive if, when we last visited, dry fountain. From the centre of the north side of the main square, a road leads to the Gordon Chapel, complete with small twin spires at its corners. Another particularly fine piece of architecture lies a little to the east of the centre of the village where the main road leads you past Milne's Primary School. 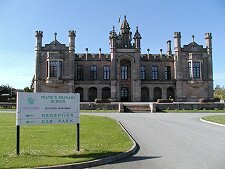 This looks more like a stately home or a college at a grand university than a primary school. 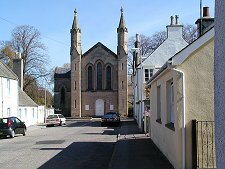 Another church on the High Street - this time a disused one - houses the Fochabers Folk Museum. This covers a range of subjects from natural history to local history, and makes an excellent visit if the weather isn't up to outdoor activities. Visitors travelling west will be surprised on the gentle climb after the road crossed the River Spey. If you avoid the new road on this side of the river, then on your right, and technically in Fochabers' western twin village of Mosstodloch, is a huge food processing and soup manufacturing factory, This is Baxters, a family-run company that has been operating in Fochabers since 1868. The Baxters factory comes complete with an excellent visitor centre. Here you can find out about the history of the company. The visitor centre also houses a good value restaurant.